Over time, Gato became a legend among our family, friends and co-workers. Barbara’s sister came out to see us and brought a blanket she made for Gato. While she was with us she also bought a little cat pillow for him to sleep on and she put the blanket on that. Gato ignored it. When Barbara had the ladies over to our house for a women’s study on Sunday nights, Gato would often sit on the porch and look inside. The former owners of our house were amazed that we could now pet him, and we even took pictures of him with and included those pictures in cards we sent to our family. We got used to having Gato around worried about him when he showed up with a chunk of hair missing from his scalp or a bloody spot on his leg, which happened frequently. Now I just I keep looking out the window, but he is no longer there. Multiple times a day I walk to the window that looks out onto our front porch, hoping once more to see that familiar face patiently waiting for me to come out. But Gato is no longer there. Judges 5:28 says, “From the window Sisera’s mother looked out. Through the window she watched for his return, saying, ‘Why is his chariot so long in coming? Why don’t we hear the sound of chariot wheels?’” Sisera was never going to return home because he was killed in battle by a woman, but his mother didn’t know that yet. She just kept looking out the window. And looking. Random Lesson #3 – How much prayer and energy have I put in waiting for people to return to God or the church? Or me? What is it about a stray cat that has left me with a larger empty space in my day than some of the people I no longer see? I asked this before but the question still haunts me, “Is my heart that big and that small at the same time?” Yes, it appears to be. Like most people who are honest with themselves, I find I’m both better and worse than I imagined. I’m kinder than I thought I would be to a creature that could do nothing for me. All the joy and sense of accomplishment with Gato was of my own making – He was just the catalyst who received nothing in return except a full belly. He didn’t even want a place to sleep. At the same time, I’m colder to people who treat me no differently than Gato did. I’ve encouraged them, invited them to join us in our journey with God and asked them to participate in our life together as a church, only to have them disappear one day without a trace and without a word. I don’t look for their return and give them less thought than I do a feral cat. And I certainly don’t write an article about them. Finally, I can only wonder how many times I have I left God waiting at the window for my return. He created me, fed me, nurtured me and provided me with everything I need to live a great life. Still, I’ve run off and done my own thing, taking my own sweet time in coming home. I’ve often planned my future without consulting Him, leaving Him alone as I orchestrate my life without His input. I’ve ignored His teaching and traded God’s love for Jim’s selfishness when people no longer agreed with me or hurt my feelings. In a hundred different ways I’ve replaced the perfect love of Jesus with the selfish agenda of Jim, only to hurt people and leave God alone at the window. And then I realized that is it me who is really alone. God is safe and comfortable and waiting for my return. It’s been two weeks since we’ve seen Gato. 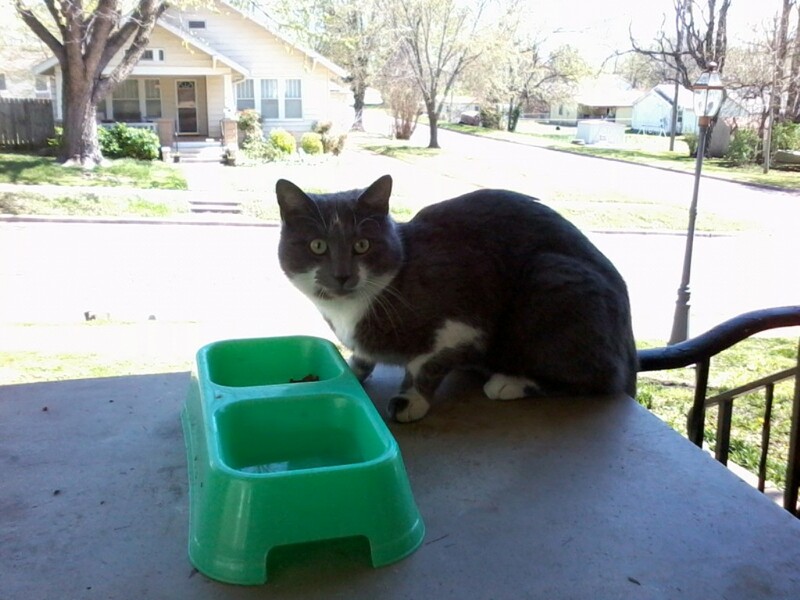 We haven’t removed his bowl from the porch, even though the food is gone and the water is mostly dried up. His little bed and blanket is still in the corner, but the only thing using it are a couple of stray leaves. After all Barbara and I have been through with Gato over the past year, we have no plans to get another cat. It was never our intention to have a cat, or more accurately, to allow a cat have us. The whole thing just fell into our lives, so we made room for one particular cat who taught us some lessons we’ll never forget. In many different ways Gato was a victory for us – a victory of patience, of trust, of the joy of making a little difference in the life of a cat who, without knowing it, made a bigger difference in us. I wonder how long I’ll keep looking out that window. I wasn’t satisfied with just feeding Gato. I wanted more. So the next time I put my plate down I bent over, put my elbows on my knees and hung my hands over the plate. If Gato wanted to eat he was going to have to get close to my hands. Naturally, when he saw me hunched over his plate he was cautious, but he came forward anyway. As he started to eat I brushed my hand across his ear. He flinched and drew back but didn’t leave. Instead, he came back for more. Now Barbara got into the act. One day she took some canned salmon onto the porch, sat down and waited for Gato. It didn’t take too long before Gato was eager to approach her for some salmon. But now Barbara upped the ante in our game of cards – she held some salmon, making Gato eat it out of her hand if he wanted it. And he did. And she petted him in the process. Every once in a while Gato would get a hold of more finger than fish, but he was so gentle that he never bit down. When we held the food in the palm of our hands, he always took it delicately. He’d even lick our fingers to get that last bit of fishy flavor we had to offer. But when the salmon was gone, so was he. And it only took nine months to pet Gato. I eventually got into a morning habit of saving an extra bit of egg yolk from my breakfast and giving it to Gato. I’d take my coffee and my plate and sit cross-legged on the porch with hands on both sides of the plate. Sometimes I’d hold out a piece of egg and he’d come right up and take it from my hand. Other times while Gato ate the eggs off my plate I’d pet his head and back. He’d squirm around to the right and then to the left, and then he’d hunch way down, pulling his ears as close to his body as he could in hopes of ducking under my touch, but he kept coming back for more. Some mornings I felt like I was pushing my limits with Gato, so I’d just set the plate on the porch and say to him, “There you go. I won’t torture you this morning by petting you. I’ll let you eat in peace.” He never showed much appreciation for my gift, but he did clean the plate well. Let’s be truthful. Gato didn’t come back to the porch because he enjoyed our presence and wanted to be touched. He came back for more food. He endured our touch to get what he wanted. Really? Fun shapes? You mean this cat ate yesterday’s food without a complaint, but today when it walks onto the porch it’s going to pause, take one look at this new food and think to itself, “This is going to be a GREAT meal! Look at all the fun shapes!” Who at the Special Kitty factory thought to themselves, I bet if we print “fun shapes” on the package it will sell more? On that first day we moved into the house, and before we even had a chance to have our own lunch, Barbara made sure the cat had food and water. And sure enough, not caring who put the food out, the cat appeared on the front porch to eat its food. It didn’t seem too impressed with the fun shapes. Now that we were the unwitting but acquiescent owners of an unfriendly, feral feline, our first order of business – besides feeding it the fun shapes – was to determine its gender and give it a name. Regarding the gender, this cat wasn’t in too much in a hurry for us know one way or another. It never stayed around the house very long after eating and didn’t seem too interested in satisfying our curiosity on the subject. However, one day it decided to lounge upon the porch in such a fashion that when it stretched out, it afforded us an unquestionable view of his maleness. Question number one answered. Now that we had this vital piece of information, we could now move onto giving this cat a name. Since we were new homeowners, simply calling it “The Cat” seemed too impersonal. As a name, “The Cat” worked if you were renting a home and petting an unknown neighbor’s cat, but since we were now homeowners it seemed only right to give this cat a proper name. Not that the cat cared, but at least Barbara and I knew who we were talking about. I keep looking out the window, but he is no longer there. Multiple times a day I walk to the window that looks out onto our front porch, hoping once more to see that familiar face patiently waiting for me to come out. But he’s not there. For over a year my wife Barbara and I fed a feral cat who visited our front porch, but two weeks ago he stopped showing up. He was there every morning before we left for work and would often be on the porch, waiting for us, when we returned home. Even though I knew the day would come when that cat would no longer be with us, I miss seeing him. Even though we never heard him meow, much less purr, and we could never approach him without him running away, I still keep looking out the window every morning and evening. We even turn on the porch light for him so he knows we’re home. It seems I miss that cat more that I miss some people who are no longer in my life. What does it say that I would spend more time looking for the return of a stray cat than I would some people returning to church? Is my heart really that big and that small at the same time?